A low voltage disconnect is a device which will automatically protect a battery from being excessively depleted of charge. Any battery which is run until it is empty or nearly empty of charge will have its operational lifetime reduced and its future ability to hold its full rated charge impaired. NEW We now have a (cheaper) mini version of this device available: Mini 12V Programmable Low Voltage Disconnect. For sale here we have a user programmable low voltage disconnect (LVD) designed for use with 12V DC battery systems. (We now also have a 24 Volt low voltage disconnect for 24V battery systems.) If the battery voltage is measured to be below a user-set low value continuously for 10 seconds then the battery will be disconnected from the load. Then when the battery gets charged and remains for 10 seconds continuously over a user-set cancellation voltage, the load will be reconnected to the battery. This LVD is fitted with a relay rated to switch loads of up to 16 Amps. The LVD is supplied with a high quality enclosure with holes pre-drilled for cable entry and exit, and all fittings. We have designed this low voltage disconnect to be as easy as possible to set up and programme. Connect it up as shown in the image above. There are two voltages which must be programmed into the controller – the disconnect voltage below which you would like the disconnect to engage, and the cancellation voltage above which you would like the the disconnect to be cancelled. These values have been chosen since it is extremely unlikely that you would ever need the disconnect voltage to be as high as 12.5V, and similarly unlikely that you would want the cancellation voltage to be as low as 12.0V. To programme the controller, the user needs to enter the number of 0.1V steps below or above these base values respectively to get their desired disconnection voltage and cancellation voltage. Five seconds after the button was last pressed, the red LED will flash X times and then the green LED will flash Y times to give visual confirmation of successful programming. That is the controller programmed, and it will now start standard operation. The values of X and Y are stored in memory and are NOT lost when the controller is disconnected from the battery even for an extended period of time. Therefore, you only need to re-programme the controller if you would like to change one or both of the voltages. If you were to inadvertently programme this controller so that the cancellation voltage was less than or equal to the disconnect voltage, the controller will automatically set the cancellation voltage to be 0.3V above the disconnect voltage. 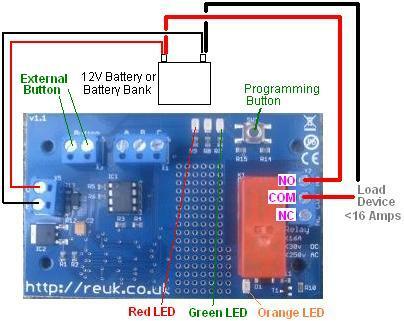 Immediately after programming, and each time the controller is connected to the battery, the red and green LEDs will flicker alternately for a few seconds to give you a visual warning that this has happened and to remind you that you need to re-programme with more suitable voltage values. When the controller is first connected to the battery, if the battery voltage is higher than the disconnect voltage, the relay will immediately close (connecting the load to the battery). While the relay is closed the orange LED will be on. Subsequently, if the voltage falls below the disconnect voltage, the red LED will turn on. If the voltage remains for 10 continuous seconds below the disconnect voltage then the relay will open disconnecting the load from the battery, the red LED will turn off, and the orange LED will turn off. Now the controller will wait until the voltage rises. (The following is also what happens if when you connect the controller to the battery, the voltage is already below the disconnect voltage). When the voltage goes above the cancellation voltage the green LED will turn on. If the voltage remains above the cancellation voltage continuously for 10 seconds then the relay will be closed (connecting the load to the battery), the green LED will turn off, and the orange LED will turn on. Now the controller will revert to waiting for low voltage again…and so on in its automatic cycle. This LVD can be powered with anything from 9 to 16VDC, more than adequate to cope with any 12V battery application. The power consumption of the device itself is <0.002A when the low voltage disconnect is engaged (relay open), and approximately 0.04A when the relay is closed (battery voltage good). The fitted relay is rated to switch up to 16 Amps of resistive loads – i.e. lighting, heating, etc, but care should be taken if you intend to use it to switch inductive loads – motors, pumps, etc since the start up surge of current to get them spinning can far exceed their stated power rating. This low voltage disconnect is hand-calibrated to be accurate to within +/- 0.1 Volts. 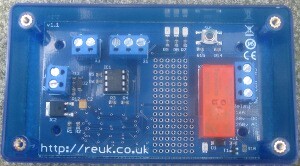 If you have any questions about this controller, please email neil@reuk.co.uk. Similarly, if this low voltage disconnect is not quite what you are looking for, email neil@reuk.co.uk with details of your exact requirements and hopefully we should be able to supply something suitable. We have also developed a low voltage disconnect circuit with built in datalogger and LCD display as pictured above. Click here for details: LVD with LCD and Datalogger.